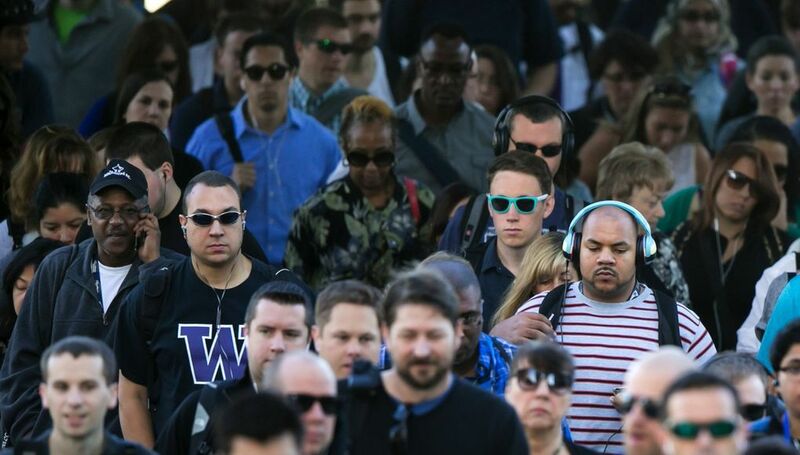 The data reveal that little, if any, of Seattle’s growth last year came from white people. That means the number of white people who moved in or were born here was roughly equal to the number of those who moved away or died. 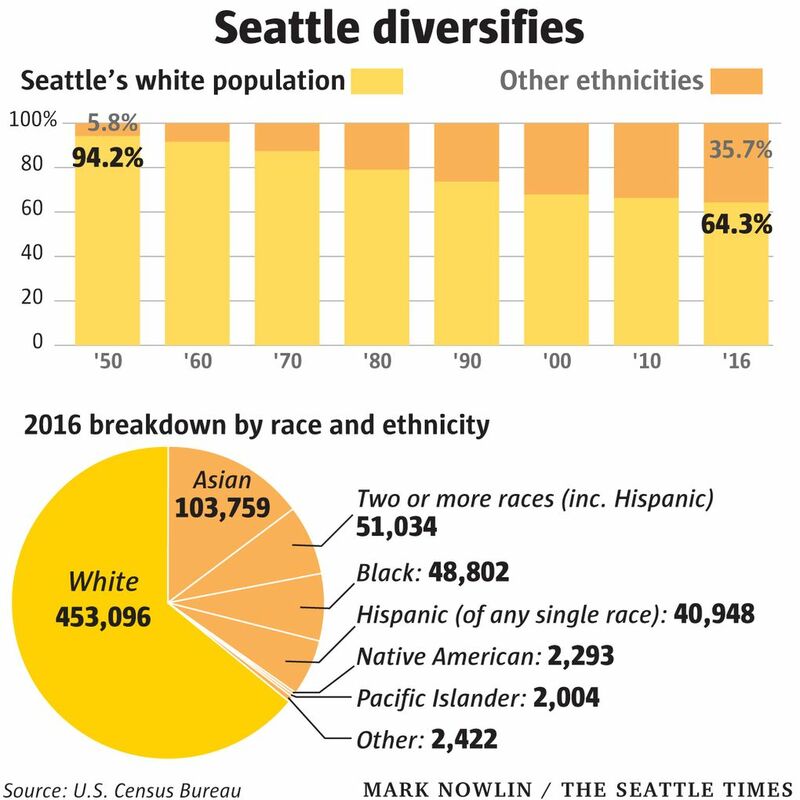 Is Seattle finally getting more diverse? Data released Thursday by the U.S. Census Bureau show that the white population in Seattle dropped to 64.3 percent in 2016, down from 66 percent in 2015 — a statistically significant change. That means Seattle is now less white than it has ever been in its modern history, and a long way from 1950, when 94 percent of the city was white. To be sure, Seattle is still very white compared with most other major U.S. cities. And yes, our ranking as the nation’s fifth-whitest big city remains intact. But the new data represent a change from the past several years. Go back to 2012, and the city, like the nation as a whole, had been getting more diverse with each release of census data. The white population dropped to 65 percent that year. But then in 2013, seemingly out of the blue, that number jumped up to 67 percent. For the past couple of years, it’s been stable at about 66 percent, meaning that the share of white population in Seattle was the same as it had been in 2010. That was particularly notable given that the rest of King County was diversifying at a rapid pace. Some parts of the South End — Tukwila, SeaTac, Bryn Mawr-Skyway and Boulevard Park — are among the most racially diverse places in the United States. Renton, Federal Way and Kent are all cities with populations made up of mostly of people of color. Last year, Bellevue joined that list. The new census data show a single-year change, so we’ll have to wait to see if the trend continues. But let’s take a close look to see just how Seattle diversified in 2016. Remember last year’s amazing growth spurt? Census data released in May showed that Seattle was, once again, the fastest-growing big city in the country. The city added about 21,000 people, and the population passed the 700,000 milestone. The data released today reveal that little, if any, of the growth came from white people. The white population of 453,000 is basically unchanged from 2015. What that means is that the number of white people who moved in or were born here was roughly equal to the number of those who moved away or died. The move toward greater diversity in Seattle was mainly driven by a sharp increase in people who identify as having more than one race. Their numbers jumped by more than 8,000, or 19 percent, to a total of 51,000. With that increase, multiracial people are now the third- largest racial or ethnic group in Seattle. Black people, whose number remained unchanged at 49,000, fall back to fourth. People who identify as having more than one race tend to be younger than other racial or ethnic groups, with a median age of 24.8 in Seattle. Other groups that increased include Asians (which includes Indian people) and Pacific Islanders, Hispanics and people who choose “other” when asked about their race. But the city’s Native American population, already small, shrank by nearly half last year to just over 2,000.